Almost a year ago I won another online contest, this one for food bloggers on the Foodie Blogroll (the listing of food bloggers you see on the bottom of the right side column). 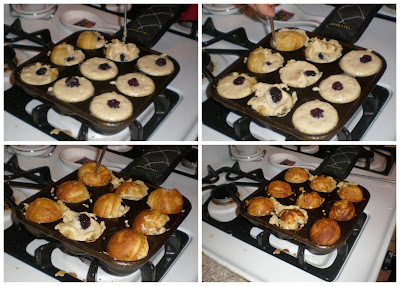 I won an aebleskiver kit that included the pan and the mix. The kit is from Aunt Else's Aebleskivers and they even have a gluten-free mix for those who need it. Some may remember that I was in Solvang last April. Solvang is a mostly Danish town in Southern California. While there we had tried some aebleskivers in the local restaurant. Aebleskiver means "apple slices". Originally they would put a slice of apple in the center of each pancake puff. Apparently that isn't done as much anymore. I don't see why not. I'd like a little surprise inside. So, in fact, we put berries inside of ours today. They are traditionally served with a berry sauce and powdered sugar. In Denmark they are eaten in December before Christmas. But they have also become popular to make and sell at special events and fundraisers - just like funnel cakes and elephant ears. I hadn't used my kit til now because it's a breakfast treat that I needed to share with someone. Today I finally had the opportunity which also means I had a cameraman to video part of it. Now I was finally ready to try it out. It took me a few tries to get it right. My first attempt was a disaster. My second was somewhat better. Third time was the charm. The first attempt failed, I think, due to several reasons. My pan was probably not seasoned enough, the oil wasn't hot enough, and I tried to turn the aebleskivers too early. You can see the mess I made and the first batch went in the trash. After scrubbing out the pan and heating it hotter the second time, I had better success - enough so that we were able to eat this batch. Finally, on try number three, I got it right. I was sure enough that I shot video. Success! Beautiful, perfect aebleskivers! You'll notice that on attempt #3 I didn't bother to fill them with a berry. If you can't see the video, what we learned was to have a hot pan and oil and to wait until the batter is bubbling (like you do with regular flat pancakes) before you try to turn them. Now that I've got my seasoned pan and got the kinks worked out, I can do some other versions. 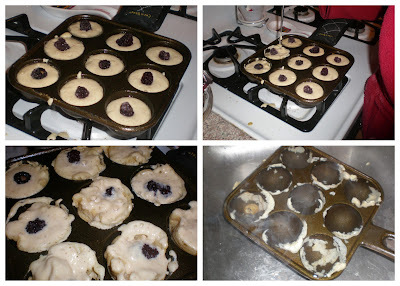 There's a great aebleskiver cookbook that you will see below in my Amazon links. It has recipes for sweet and savory versions. Also, the pan can be used for making Japanese Takoyaki, or octopus balls. If you get the chance, make them. But at the very least, if you come across them at some Danish event, give these tasty treats a try.